When people ask me for my favorite pizza in all of New York there are two places that I always mention: Di Fara and Luzzo’s. But don’t misunderstand. They could not be more different. Di Fara is unique for many reasons and is an example of true New York pizza. Dominic DeMarco is a testament to that. 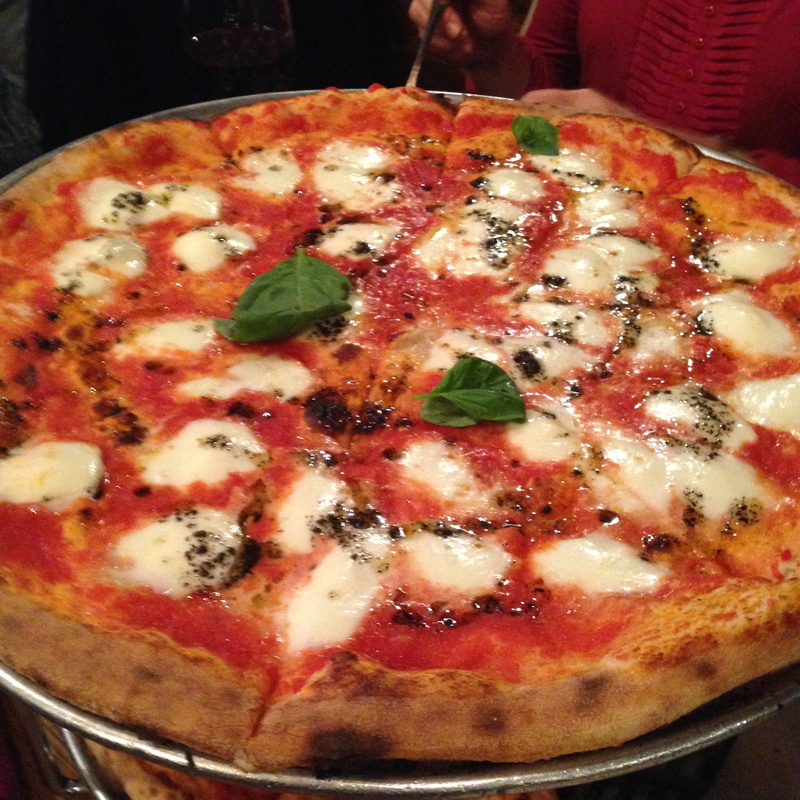 But Luzzo’s… Luzzo’s is truly authentic Neapolitan pizza. So much so that I didn’t even know about it until my dad returned home from Italy. Upon walking into the unassuming restaurant off First Avenue this past Sunday, we were greeted by a server originally from Naples and an older Italian gentleman who’s been seated in the first booth to the left every time I’ve returned as if he’s a mainstay. Even the television had an Italian soap opera playing with subtitles for the American patrons — a smart staging strategy to feign authenticity, but the food was the true mark of the restaurant’s Italian ownership. It’s the pizza you come here for and it’s the pizza that keeps you coming back. We ordered two large 16” pizzas to share among the three of us: one tartufata with tomato sauce, mozzarella, truffle pate and basil and one bufala with tomato sauce, mozzarella di bufala and basil. The pies tasted of the freshest ingredients, which are imported from Italy, and just looking at them made you salivate. The truffle pizza is especially notable and a must to order. While I’ve had many pizzas with truffle oil (I’m looking at you, Toby’s), this one masters the act of balancing the richness of the truffle pate with fresh tomato sauce and a charred yet chewy thin crust that leaves a perfect finish in your mouth. It’s like a fine wine that has a flavorful palette and a smooth finish that encourages another sip, or wait, maybe that was the Montepulciano we paired it with… the perfect partner. By the end of the meal, nothing but compliments escaped our lips. “This is delicious,” my dad said mid-bite. “It feels good to chew it,” my step mom said of the crust. “It’s perfectly charred,” I couldn’t help but offer up. Even in the absence of words you could tell we were all in a euphoric state of satisfaction. Our eyes did the talking as we strategically placed a target on our next slice. The executive pizzaiolo Michele Luliano deserves full credit for the perfect pies being churned out at Luzzo’s. Luliano emigrated from Italy to New York in 2000 and brought with him the techniques and recipes of his Italian heritage with the goal of transforming the city’s food scene with true-to-form Neapolitan dishes. Since opening Luzzo’s, he’s since opened a few other authentic Italian restaurants Da Mikele, Ovest Pizzoteca, Luzzo’s BK and Bar Trenta. Luzzo’s was the first to open though and their 100-year-old coal oven makes Luzzo’s stand out among other New York pizzerias where $1 slices are reheated in electric ovens or wood-burning ovens are winning out. Luzzo’s pizza is truly heavenly. And the best part? You don’t have to travel beyond the East Village to get a slice of Naples.